1. What is a Marine Breakaway Coupling? The Marine Breakaway Coupling (MBC) is a device installed into hose transfer systems at offshore tanker discharging or loading terminals. The MBC is designed to prevent oil spills and protect the transfer system from damage in the event of a tanker breakout or an excessive pressure surge. Tanker breakout is a vessel moving off station and breaking its mooring hawser or similar such incident. An excessive pressure surge is caused by the inadvertent closure of the export tanker manifold valve during full flow conditions. The typical cause of a pressure surge is the inadvertent closure of the export tanker manifold valve or the failure and slamming shut of the hose end butterfly valve (if fitted) during pumping operations. 2. What are the benefits of installing an MBC? Environmental pollution due to oil spills and the cost of oil spill clean-up can be considerable. The simple installation of an MBC will minimize the risk of oil spill and help to safeguard transfer equipment from the consequences of tanker breakout and help protect the system against the event of pressure surge. The danger to capital equipment such as the hose string, mooring buoy structure or storage vessel off-take arm, sub-sea P.L.E.M. (in the case of a C.B.M. system), shuttle tanker or barge manifold can be substantially reduced with the fitting of a Gall Thomson MBC. The risk of costly vessel and transfer system downtime caused by spill and damage is also minimised. Not only does the Gall Thomson MBC protect against the detrimental consequences of excessive pressure surges, but it is also totally unaffected by the usual pressure fluctuations experienced during normal transfer operations. 3. How does an MBC work? The MBC is designed to provide an identified safe parting point in a hose transfer system. When its pre-set parting load is exceeded, the MBC activates; the valves close and shut off the line either on one side or both sides of the parting point as required. 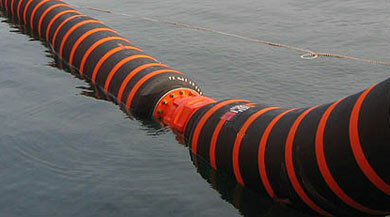 The coupling separates and relieves the tension in the hose system before it can rupture. Closure may be controlled or instantaneous depending on the specification of the MBC as determined for the system. 4. What type of MBC is most suitable for my application? The Petal Valve MBC is suitable for handling heavy products such as crude oil and heavy fuel oil. The Flip-Flap MBC is suitable for low viscosity products such as gasoline, kerosene, diesel and LPG. Type of terminal: for example SPM, CBM, FPSO, FSO, Jetty. Product being transferred: for example Crude oil, fuel oil, gasoline, kerosene, diesel, LPG. Maximum actual flow rate m3/hr). Kinematic viscosity (cSt) of the product (if available). 5. Can an MBC be re-assembled following activation? Following a parting incident, the MBC can be re-instated and used time after time. The MBC can be re-assembled either on-site by the operator’s own technicians and following simple-to-follow written instructions or the MBC can be returned for re-assembly at the Gall Thomson UK manufacturing and servicing facility. Gall Thomson can advise that the vast majority of major oil company clients are sending MBC units back to the Gall Thomson factory. This allows them to divest themselves of the responsibility for refurbishment work and benefit from the Gall Thomson warranty and the ensured long-term integrity of the device. 6. Can Gall Thomson supply a service engineer to service/re-assemble an MBC? In certain instances it is not possible for a client to ship the MBC back to the UK for refurbishment. On these occasions it is usually possible to send a Gall Thomson engineer to site to perform the work. This is dealt with on a case-by-case basis. 7. What are the most important and unique features to look for when buying an MBC? When handling high viscosity products such as crude oil or heavy fuel oil, be sure to request a full bore unit with all valve components sealed off from the product flow during normal service. This ensures no erosion, corrosion or clogging of the valve components will occur and the result is total reliability and integrity in operation. Additionally, ask for a compact, lightweight, radially in balance unit with a body diameter less than that of the adjacent hose flanges and hoses. This ensures ease of handling and protection from both impact and external mechanical damage when installed in the hose string. The larger and heavier the device, the greater the risk of auto-submersion of the hose strings. For example the weight in air of a 16”NB. Double Closure Petal Valve MBC #150lb should not exceed 550Kg. The valve closure speed should be infinitely variable and it should be possible to change the valve closure speed without dismantling the unit. The MBC supplier should have documented evidence of its capability to carry out a basic surge analysis to determine the optimum valve closure speed of the MBC. Only consider an MBC that has long-term proven field experience, preferably with more than 10 years of continuous operation in the field. This will provide proof that the unit can withstand extended periods of stress imposed by both constant wave motion and the general harsh conditions of the marine environment. Untried MBCs may be prone to failure due to operational bending forces, torsional stresses and cyclic fatigue. A substantial client reference list specific to the exact type and model of the MBC offered should be available. Documented evidence should also be available for inspection in respect of past successful MBC activation incidents during both tanker breakout and extreme pressure surge incidents. 8. What are the International recommendations regarding the use of MBCs? Many clients believe that MBCs are associated with OCIMF Standards, however, these standards are specific to the design, manufacture and testing of marine hoses and have no relevance to MBCs, which are a completely different type of product. Although the OCIMF Standards recommend the employment of MBCs, there are no governing body rules relating to the device. No such equipment existed prior to the invention of the original MBC by Gall Thomson, which has since become the “Industry Standard”. The Gall Thomson MBC is in fact deployed by every major oil company and a vast number of lesser known operators around the world. You could say that it has created its own standard. The Gall Thomson MBC is a proprietary device with a track record of more than 1,650 units supplied world-wide over a 35 year period. The Gall Thomson MBC is manufactured and tested to accepted oil field procedures and quality requirements; including oil industry standard materials. Gall Thomson MBCs are also independently tested and witnessed by third Clients as well as Third Party Classification Societies such as B.V., Lloyds, ABS and DNV. 9. Are there any ancillaries recommended for An MBC? Flushing Adaptor Spool may be considered to facilitate the evacuation of product from the line in the event of MBC activation. This device converts the parted MBC ends into standard flanged connections which can be bolted directly onto the tanker manifold or the support vessel flange for line flushing purposes. Floatation Collars are available to reduce the residual weight of the MBC when immersed and full of product in the hose line. Double Closure Petal Valve MBCs for floating hose strings are supplied as standard with one floatation collar fitted to the downstream end of the unit. In certain cases, clients specifically request two floatation collars, one fitted to each half of the unit. Resetting/Refurbishment Spares Kits are available and should be held in stock in case of an unexpected activation during a tanker breakout or extreme pressure surge incident. Blind flanges are available should it be necessary to blank off the hose end following MBC activation and connection of the Flushing Adaptor Spool. 10. What is the lifespan of an MBC? The expected design life of a Gall Thomson MBC is 15 to 20 years. The longest serving MBC units have been in service for 33 years. (MBCs supplied to a North Sea marine terminal operation in 1981 and are still in service today.) Gall Thomson cannot guarantee that the life span of the MBCs will be beyond 25 years as we have no control over the client’s refurbishment philosophy (including the paint system). 11. What additional after-sales support is available? Refurbishment of units following 3-5 years in service. Advice on operations and maintenance. Pro-active technical sales team visiting clients.